The Senior (over 50) B Dragon Boat crew of the Philadelphia Flying Phoenix club takes off for practice on the Schuylkill, with Colleen Law (left, forward) on the bow as the drummer and Cris Nast (right, rear) on the stern as the steer. If you haven't seen an actual dragon boat by now, chances are you've heard of it. Or you've seen pictures. Or you have a friend on a team who posts her medals on her Facebook feed. But what most people don't know is that the ancient Asian water competition, involving boats adorned with dragon heads, 10 pairs of paddlers, a steersperson, and a drummer, is exploding across the United States. Or that Philadelphia — where American dragon boating got its start — remains at the crest of the sport. 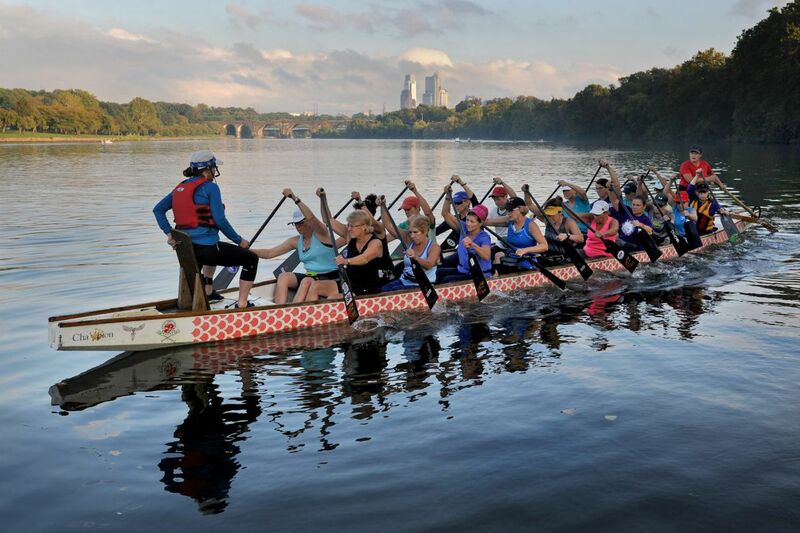 On Saturday, more than 110 teams, and at least 3,000 paddlers, will take over the Schuylkill for the Philadelphia International Dragon Boat Festival, among the largest one-day dragon boat events in the United States. A Dragon Boat practices on the Schuylkill River in September. At the same time, the country's most elite dragon boat paddlers – Team USA – are training for the world championship starting Oct. 18 in Kunming, China, with Philadelphians heavily represented on the team and its coaching staff. There are no national statistics on dragon boat participation, because many of the festivals attract community groups or companies for short-term team building or charity drives. But places as far flung as Dexter, Ore.; Minocqua, Wis.; and Norfolk, Va., are touting first, second, or third annual dragon boat festivals. In July, the Cooper River held its second annual event, and Bucks County held its third on Sept. 23. At the hundreds of festivals around the country, "people who never participated in a team sport because they're not athletic suddenly experience the adrenaline of competition. It's their little Olympic games," said Mike Kerkmann, who runs Pan Am Dragon Boat, one of a half dozen firms that rent dragon boats to festivals. Philadelphia is a hub for more serious teams, with practices up to five times a week and eyes on national and international meets. It boasts the oldest competitive team in the country, the Philadelphia Dragon Boat Association, as well as a Police Department team, a Penn alumni team, a couple of breast cancer teams, a Chinatown team, a Fujianese team, a middle school team, and the all-women Philadelphia Flying Phoenix, which has won national championships. Others have sprung up in the suburbs. The Witches of East Greenwich in Gloucester County has grown from two teams in 2009 to nine teams today. Havertown now has nine teams, 180 paddlers. The Philadelphia festival, dating from 2002, is "huge," said Bob Morro of Wallingford, secretary of the national and international dragon boat federations for 30 years. "We used to have senior boats to age 50. Now we're pushing 80. There are also teen categories." Lyudmila Kuznetsova (right) with teammate dentist Mamle Mante and her husband Frances Mante. They row on the Dragon Ladies team. Philadelphia dentist who first tried paddling in May with the Dragon Ladies, a Main Line team. After a handful of practices, the Dragon Ladies raked in a women’s division gold medal at Philadelphia’s Independence Dragon Boat Regatta in June. "For me it was a chance to be on the water," said Kuznetsova. She loves the exercise and the social aspects of being on a team that draws on newcomers to the region. Its 25 members, ranging in age from 30 to 71, currently include several French women, a Chilean, a Belgian, two Russians, and its captain, Pauline Seeds, formerly of England. Three women are on a wait list for next year. "I like the international group. It makes me look at the world in a very broad way," said Kuznetsova. Adding to the surge are survivors of breast cancer, among them Philadelphia lawyer Lynn Marks. "Sport is a life-changer for most of us," said Marks, who for 25 years headed Pennsylvanians for Modern Courts. After breast cancer in 1998 and a double mastectomy in 2006, she joined Against the Wind, the area's first breast cancer team, founded in 2001. It will compete in July in Florence, Italy, in the international breast cancer dragon boat festival. Global interest is so great that registration closed a year before the event. "It's empowering to know after a life-threatening disease you can do something physical," said Marks, adding that it's also important socially, mentally, and spiritually. "Physically, because of the training, pushing ourselves to be as good as possible for racing. Socially, because we're meeting new people. Mentally, it clears your head." And she finds simply being on the Schuylkill a spiritual experience. Members practice five times a week in 40-foot dragon boats and one- or two-person outriggers. "We don't talk a lot about having cancer," she said. "We have in common that we know we could have a recurrence. When that's diagnosed, we gather around them." American dragon boating began in Philadelphia in 1983 after the Hong Kong tourist bureau asked USRowing to send a team, all expenses paid. John Breen, then 23, was the youngest on the team, which was made up of a Who's Who of rowing, he said. Among them were John B. Kelly Jr., the champion rower for whom Kelly Drive is named, and his son, J.B.; Drexel University crew coach Joe Greipp; USRowing official Ken Shaw Jr., then a coach at LaSalle College High School; and Dietrich Rose, who had helped coach Philadelphia's Vesper Boat Club's eight to an Olympic gold medal in 1964. "The short story is, they shipped a teak boat here from Asia, and we practiced every morning on Boathouse Row, and then we went to Hong Kong," said Breen. Stunningly, after five days of racing, "it was China first, USA second." Breen, like others on that first team, never imagined dragon boating would become so central to his life. 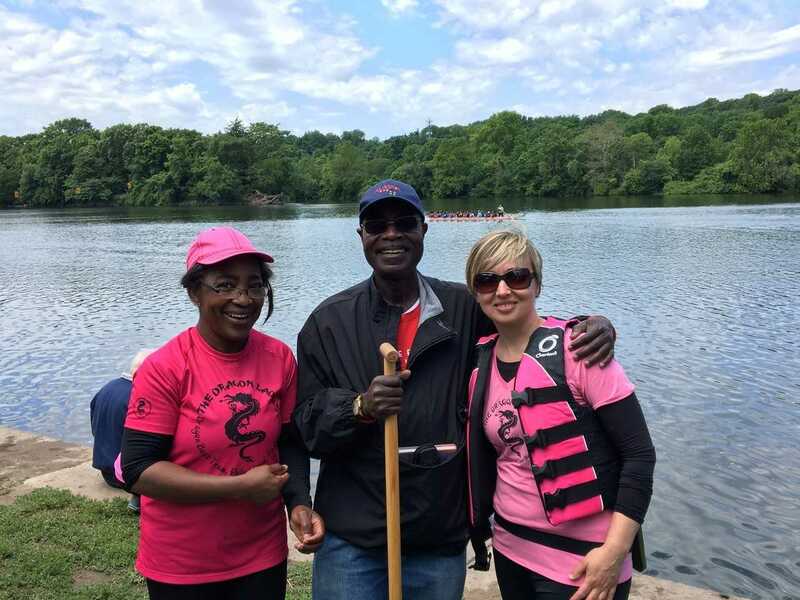 Today, he coaches Hope Afloat, another local breast cancer team, and trains dragon boaters and other athletes at Cadence Fitness in Narberth. “Coach Bob” (Robert McNamara) joined Team USA for a free trip to China and ended up coaching it two years later. has won more than 100 world championship medals, including 23 golds. It also holds world records in the 500 meter: 1 minute, 48 seconds for the men's team; 1 minute, 53 seconds for the coed team. 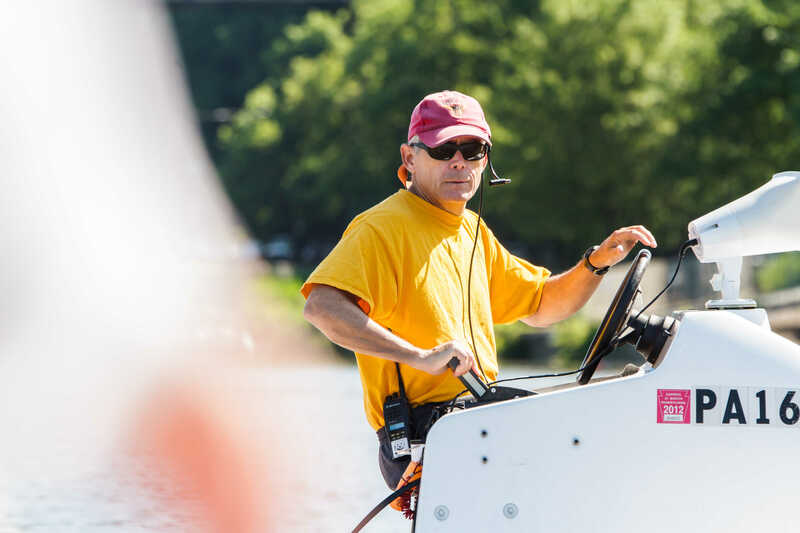 McNamara is on the Schuylkill several mornings a week by 5:30 before going to his job of 30 years as chief of emergency medicine at Temple University's Lewis Katz School of Medicine. Along the way, his four children and brother caught the bug. Daughter Colleen is a three-time world champion. Philadelphia remains the "recognized perennial powerhouse" in dragon boating, he said, because "it came out of the rowing community, with that work ethic, that culture of beating the other teams by working harder than them." As for its growing popularity across the country, McNamara says, "Anybody can get in a dragon boat and survive. It's a big enough boat that balance isn't an issue. You get on the water with a lot of other people, and it's a lot of fun." Dotty Brown is author of Boathouse Row, Waves of Change in the Birthplace of American Rowing.